You Take the Photos, We Make the Videos. You can change/add photos, select your theme and music and personalize your slideshow to fit your needs. Imagine creating beautiful slideshows from the party last night, your last vacation, or creating a video love letter for that special someone. You can share your slideshow on Facebook, WhatsApp, Twitter, Pinterest, or via text or email with the world or just your friends and family. Now you can put words into your friends' mouths (literally) with FaceTalk! Just grab a photo of your friend on Facebook, record whatever you want to say, and your friend's face will speak back anything you tell it to. You can even record a video to share with all of your friends on Facebook, or with all of our FaceTalk fanatics on our FaceTalk YouTube Channel! Get creative! You can make anyone or anything FaceTalk - dogs, dinosaurs, Britney Spears, George Washington, whatever you can get your hands on! The FaceTalk mobile app allows you to a pick photo from your photo album, camera, or Facebook. You can select your photos or your friend’s photos and turn them into living, breathing FaceTalkers! Make your pictures talk! Superimpose any video clip over any still photo. Make your pets sing and make your friends say funny things. The results are always pure comedy gold! Mad Lips is a fun, quick, and easy video-editing program. Transform your pictures into talking video animations. Choose a photo, record a video of yourself saying something silly, and place your talking lips on that photo. That’s it. It works every time. "Metta is an outstanding digital storytelling tool. With a minimum amount of time experimenting with all the available options, you can have a story (movie) created. The Metta editor is a timeline based tool that enables its users to synchronize videos, pictures, text and sound that can be pulled from any source on the web. What makes this nice for educators is that a user can create Guided Learning videos and then embed them into a site/blog. Create quick movies out of videos, pictures, text & sound that are already on the web or just upload your own material. Insert polls & quizzes into your learning stories, video-based posts, share them with your audience and know their reactions. Collect media wherever you’re browsing the web with a powerful bookmarklet. Papercade is a mobile game from Hololabs where players create & share tiny paper game-worlds crafted together from the pieces of their lives. This video features a few clips from the early prototype. 9 cubes, 54 images, Over 10 million combinations, Unlimited stories! Shake to roll the cubes. Can you create a story using all 9 face-up images? Now digital storytelling has gone mobile - so get ready for the many varied ways students find themselves expressing their world. 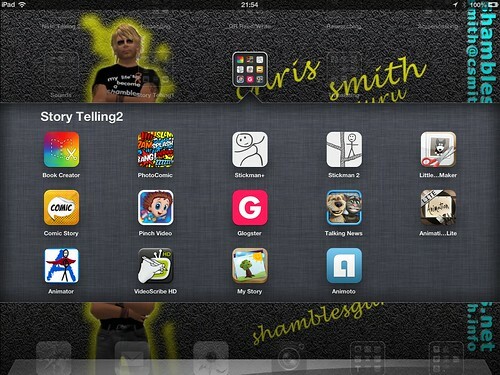 Here are a number of iPad / iPhone apps that provide tools for these emerging mobile devices enabling students to participate in the long and rich history of storytelling. No matter if you are a parent, a teacher or a kid. You’ll love this interactive app. Going for a drive? Create and record your very own version of a Fairytale. Or are pirates and cute little aliens more your thing? We got all that and more for you to play with! Long drives are no issue any more when your kids listen and look at the story you recorded for them or make their own. 30hands Mobile is a fun storytelling app that allows students, teachers and anyone with creativity to easily create stories or presentations based on photos, images or slides using a smartphone or tablet. Tellagami (rhymes with origami) is a quick and easy way to create and share a fun short story called a Gami. Have fun telling your story at tellagami.com. With Tellagami, telling your story is fun and easy. We’ll help you create your own story or you can watch one of our own. What’s a story? It’s a simple birthday greeting. It’s a heartwarming tale between a dog and a kid. It’s what happens when you close the fridge or whatever pops into your head. You can customize your story with our characters, your own voice, or add photos and videos. It’s up to you. Visual recording is similar to audio recording: they both use the same concept that is : recording. One uses voice and the other uses visual cues like diagrams, charts, lines, arrows...etc. Think about visual recording as visual mind mapping. Visual recording using your iPad is something you can best do via the help of some powerful apps. The video below will walk you through the process of how to capture your ideas visually on your iPad. It will also show you how to use each of the four apps suggested. Spin the wheel and land on an image. Now it's your turn to make up part of a story with that image. You'll have 30 seconds to record your voice as you add to the story. As you progress, the previous images are displayed on the side so you can keep track of the storyline. If you're like us, you've been looking hard for the perfect (th)inking App. Yet something always seems to be missing, be it speed, flexibility, or just plain elegance. Well, we think we've finally cracked it. Rather than just read about Inkflow, go ahead and try it out: We've decided to make the Basic Edition of Inkflow completely FREE. The Basic Edition comes with the Fountain Pen in black ink and all the features above. Books max out at 20 pages each, but you can create as many as you like. The easiest and fastest way to make cartoons on your iPad. Cut anything out of your photos and move it on the screen. The app will record everything you do. You can use lots of ready-made puppets or custom ones (including PNG files with transparency) and edit the recording via a timeline (like in iMovie). Then - export to YouTube! This is the only animation app for the iPad that allows you to use a timeline with precise time and movement control. You can edit individual object movement tracks. Making movies on a shoestring budget? No need hunting for talented actors, building a stage or even writing a script. A bit of clay or a toy can be the star of your animated masterpiece. Spending quality time with your kids? Watch them tap their creative potential and be amazed at what they create. iStopMotion for iPad is also ideal for use in the classroom and in all disciplines, honing creativity, problem-solving and communication skills in students of all ages. There are lots of apps that let you paint, or make simple digital stories, or create comics, but Pixie combines the best features of all of these tools into one easy-to-use package. Paint a picture, create a trading card, or explore the curriculum using one of hundreds of activities. From digital storytelling to comics, Pixie makes learning fun. Paint pictures, add images and photos, record student voice, write and edit text to tell a story and create powerful examples of learning. Allows teachers & students to quickly ask & answer each other's questions with text & their own videos. This FREE app turns each iPad into a whiteboard that can record voice & visuals for instant classroom sharing. Ask3 is a tool that teachers can use to create short instructional videos that are shared directly to their students’ iPads. Students can use Ask3 to ask questions about the video, mark the video with drawing tools, and create their own audio comments about the video. A completely unique tool for desktop and iPad for creating engaging animated content to tell your story. This video is an example of what can be produced ... part of a playlist. With Scribble My Story, kids can illustrate their own audio stories or create a book based on Fingerprint’s wildy popular Big Kid Life or Whole Wide World Adventure. Scribble My Story is a (free)junior version of the popular and award winning Scribble Press App, selected by Time Magazine as one of the 25 best apps of 2012 and widely in use in classrooms. Targeted at kids 3 to 7, Scribble My Story is a design collaboration between Fingerprint’s early learning experts alongside the Scribble Press team to deliver a wonderful, age appropriate creativity experience. Pixntell is an iPad app for quickly creating simple narrated photostories. To create a story using Pixntell all that you need to do is start a new project, select some images, place them in order, and then start talking about each of your pictures. You control the timing for each image. DisplayNote lets presenters and audiences connect like never before, and on the platform / device that suits them. That makes it the perfect tool for 1-to-1 and BYOD (Bring your own device) initiatives. Users can instantly connect with the presenter and access their content, make that content their own and collaborate with other participants such as colleagues / classmates. Capture the presenter's notes, slides, images and video in real-time and all on your own device. Highlight what is important to you, underline key phrases, mark / tag important items for later review, and send annotations to other connected devices. A little flavour of what's to come in DisplayNote from DisplayNote on Vimeo. Easy and fast, create a digital story with photos, drawn images, audio recording and sound, then share via email, embed or MP4! Educreations : I initially described this as a Screencasting App for the iPad .. that that does it a disjustice. It is much more .. its use of multiple screens and audio recording makes it very easy to use as a digital sorytelling authoring tool. I'm blown away by this App on the iPad and at the time of writing this it is free ... I cannot imagine it will stay free as the developers are also maintaining a website to upload your creations to the web for pubic or private viewing. "It's Your Personal Recordable Whiteboard. Educreations transforms your iPad into a recordable whiteboard that captures your voice and handwriting to produce amazing video lessons that you can share online. It's as simple as touching, tapping and talking." Finished lessons are hosted on educreations.com, where you can choose who is able to watch them. Send your lessons to friends, students or colleagues, or share them publicly on educreations.com and teach the world! Our handwriting technology renders beautiful digital ink that looks even better than the real thing. Make a mistake? No problem, you can always undo and redo any of your actions. On the website you can also create lessons in a browser .. and when signed in then you'll see your creations from all devices. "Rachel, my 8 year old daughter, just finished reading “Christmas in Camelot” (a Magic Treehouse book) this weekend and was VERY excited to tell me all about it. It’s been a few years since she last made a VoiceThread book report, so since the VT iPad app is now available I figured this would be a perfect chance to put it through its paces. We had fun and were successful making the VoiceThread book report. Here are a few of our lessons learned." Simply pick out your actors and backdrops, drag them on to the stage, and tap record. Your movements and audio will be recorded in real time for playback later. ARIS is a tool for making location based games, stories and Art. People all over the world are creating content for ARIS using an easy online authoring tool. Reading, even in the digital age, is probably one of the most important skills that children acquire. It can be an important source of pleasure which also develops vital language and social skills. It is fundamental to most school activities, it can also open up new worlds and give access to the wealth of human knowledge. Story Patch is a beautiful new application now available for the iPad that allows your children to tell stories in a fun and intuitive way. Story Patch includes hundreds of illustrations and an easy to use interface that makes storytelling a breeze for kids. If you have a child that loves being creative, take a look around and we think you will agree that Story Patch will make a great addition to your software library. Anywhere, anytime, stories are waiting to be discovered. On vacation with your family, hanging out with friends, or on assignment – Blurb Mobile helps you share your stories. It’s easy to create fun and engaging stories using all your iPhone media. Instantly share with your social network using Facebook, Twitter, and email. Blurb Mobile’s standard version is free, then you can choose the in-app upgrade to add more video, audio and image capabilities, plus eight additional theme styles. 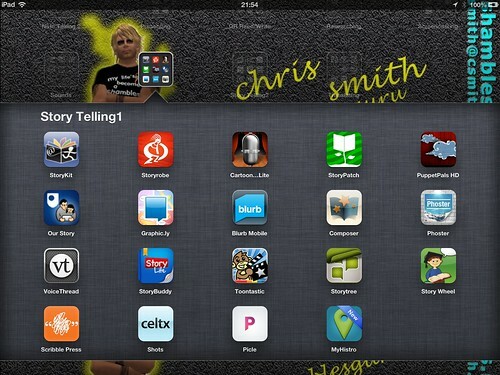 Storyrobe is an exciting digital storytelling application for the iPhone and iPod Touch. Storyrobe lets you tell create digital stories using images and video from your camera or photo library. You can use the built in microphone, or any 3rd party microphone to create audio recordings with photos and videos. Use Storyrobe to tell, share, and add to others stories creating a Storyrobe™.